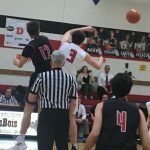 DUBOIS — It wasn’t easy, but the Clearfield Area High School boys basketball team was able to overcome an inspired effort by Bradford for a thrilling 63-61 victory in the District 9 Class AAAA championship game on the DuBois High School hardwood Wednesday night. 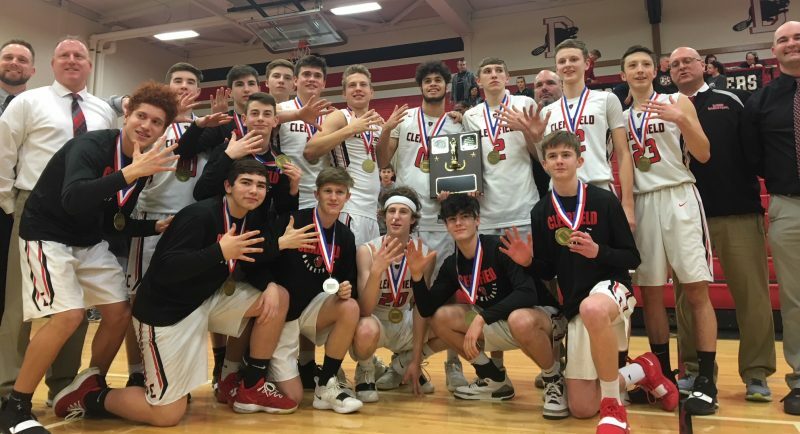 Balanced offense, with all five starters in double figures, and a slight edge at the foul line enabled the hot-shooting Bison to celebrate a fifth consecutive district title, the first two of which were in Class AAA before the PIAA expanded the classifications to six. Cade Walker led them with 13 points, Karson Rumsky and Keagan Hess were right behind with 12 apiece and Taye Lynch and Andrew Lopez chipped in with 10 apiece as the Bison shot 57 percent from the field and 71 percent at the charity stripe with 17 free throws. Each stepped up with important baskets in key moments, as did Matt Pallo with six points off the bench. Coach Nate Glunt also cited reserves Harrison Peacock, Luke Winters and Barrett Kline for providing valuable minutes that had the No. 1-seeded Bison (13-10) playing hard right to the buzzer, which they had to do even though they owned the lead most of the game. “All those things add up. Just a total team effort,” the very hoarse Clearfield coach said after accepting congratulations from several fans who patiently waited as he received hugs from his family. “I’m so proud of our kids to come out and play the way they did,” he said. “Bradford is a well-coached team. Coach (Brian Hobbs) does a good job with his kids and how they play together, play with passion. We’ve played them four years in a row, and every year it’s a battle. paced action up and down the court with players on both teams constantly attacking the basket. With the score 12-12 after six see-saw minutes, the Bison went on the first of their two mini-runs to finish the first period in front 21-14. Hess played a key role with a dish to Lynch on a fast break, a putback and a steal for a reverse layup. Walker drilled a three-pointer and Lopez drove for two. For Bradford (11-13), Tyler Gigliotti and Steve Knowlton each had seven points. 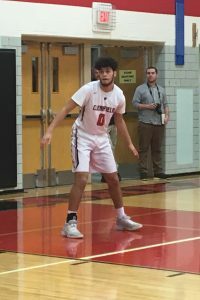 Gigliotti dazzled the rest of the way, too, with his dribble penetrations and soft jumpers to go with a pair of three-pointers in an impressive 30-point performance. “He’s an excellent player and does a good job,” Glunt said. 6-6 back-up center Blake Bryant and a three-pointer by Caleb Nuzzo with just two ticks on the clock had the Owls down only 30-27 at intermission. The teams were never separated by more than three points in the back-and-forth third quarter, with the Bison falling behind three times. Walker’s two free throws with 1:18 remaining had them clinging to a 42-41 lead going to the fourth period, which proved to be high scoring. After Bradford went ahead for the sixth and final time at 44-42, Clearfield went on what has to rank as the most unusual run of this or any season. The Bison registered five three-point plays in succession while outscoring the Owls 15-6 in a little over three minutes. Rumsky’s trifecta was the only one from behind the arc, though. Four were of the old-fashioned, and-one variety on drives by Lynch twice, Hess and Pallo, though the latter wasn’t able to complete his because of a bloody nose. Lopez entered and took care of the free throw that made it 57-50 with 1:57 remaining. Then, Clearfield gave Bradford opportunities to make a comeback by, inexplicably, missing five consecutive free throws. “We’re thinking, aww, this is not good,” Glunt said. The Owls failed to take full advantage, however, because of a missed shot and a turnover after a runout by Knowlton. And the Bison clutched up at the foul line in the final 21 seconds, Rumsky sinking two free throws and Lopez coming through twice to restore five-point leads following Gigliotti scores. Knowlton made the score look much closer with a heave from near midcourt at the buzzer for his third trey and 15 points. The Owls matched the Bison in field goals with 21 for 48 percent, so rebounds were at a premium. Clearfield had a 21-20 edge with Lopez pulling down eight misses. Hess matched his career high in points, and the senior guard was credited with a good all-around game by Glunt, who said “That’s how he’s practiced. He’s had four or five really good practices. He had an excellent scrimmage Monday. Moving Walker out to the perimeter when Bryant was defending him was a factor, too, according to Glunt. Clearfield’s opponent in the first round of the state tournament next week will be the loser of Saturday’s District 7 (WPIAL) championship game between Quaker Valley (20-3) and New Castle (18-4). Taye Lynch 4 2-2 10, Cade Walker 4 3-3 13, Karson Rumsky 3 4-6 12, Keagan Hess 5 2-5 12, Andrew Lopez 2 6-8 10, Matt Pallo 3 0-0 6, Harrison Peacock 0 0-0 0, Luke Winters 0 0-0 0, Barrett Kline 0 0-0 0. TOTALS: 21 17-24 63. 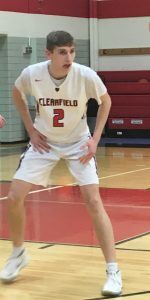 Three-Point Field Goals – Bradford 4 (Nuzzo 1, Knowlton 3); Clearfield 4 (Walker 2, Rumsky 2). Officials – Scott Sullivan, Dave Blair and Emory Faith.